Lieutenant Colonel George Washington Goethals saw the Panama Canal to its completion. From 1907 to 1914 he successfully oversaw the project that for almost 25 years had consumed millions of dollars and thousands of lives. He was called "the Genius of the Panama Canal." But Goethals felt unworthy of this title, saying that his predecessor, John F. Stevens, truly deserved it. John Stevens was appointed chief engineer of the Panama Canal Project in 1905 based on his accomplishments -- some might call them feats -- at James J. Hill's Great Northern Railway. The fearless Maine native helped Hill carry out his plan to expand his American rail lines west, and thus contribute to the white settlement of the Pacific Northwest. Native Americans had long described a traversable gap in the Rockies that white explorers had not yet found. In December 1889, aided by a Flathead Indian guide, Stevens walked the Marias Pass in Montana -- in 40-below weather, no less. What Lewis and Clark and countless others had tried, Stevens accomplished. The Marias Pass, the lowest crossing of the Rocky Mountains, allowed the Great Northern to expand through the Rockies without a tunnel. The following year, Stevens conquered another pass - now called the Stevens Pass -- in Washington's Cascade Mountains. 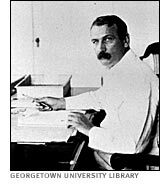 President Theodore Roosevelt knew Stevens was the right man -- perhaps the only man -- to tackle the catastrophic Panama Canal Project. The Canal's "affairs [were] in a devil of a mess," TR said. The French had begun work on the canal in 1883 lacking experience in Panama's jungle terrain, and also lacking a blueprint. Unskilled excavation led to deadly landslides; outbreaks of malaria and yellow fever took hundreds of lives a week; and effort and money were wasted when railroad track was laid that didn't fit the gauges of the existing railroad. When the project changed hands, American workers didn't fare much better. Enter John Stevens. The foremost civil engineer of his day, Stevens stepped in when his predecessor abruptly quit, and he approached the project as a humanitarian effort, as well as an engineering one. With confidence and morale desperately low among the workers, one of Stevens' first actions was to introduce a food car, a haven of entertainment and much-needed sustenance for the men. In addition, Stevens parted company with most high-ranking officials by taking seriously the threat of yellow fever-carrying mosquitoes, and he insisted that workers be immunized against yellow fever (it was impossible, unfortunately, to immunize against malaria). The last case of yellow fever was reported on November 11, 1905, shortly after Stevens' arrival. His workers' welfare on the mend, Stevens drew up logical plans for the canal's construction. One of the first things he did was to call on 27-year-old Ralph Budd, a gifted manager who would go on to develop streamliner trains at the Burlington Railroad. Stevens had supervised Budd at the Rock Island Railroad in Kansas City, and he recruited him for the difficult job of building a railroad across the Panamanian isthmus. Engineering advances, including Stevens' successful push to build a loch system instead of a sea-level canal, were coupled with social ones. Like his Great Northern boss, Stevens built transportation infrastructure and new communities side by side. Lacking the advanced degrees of many of his colleagues, Stevens shunned any special treatment as an officer. The living quarters reserved for him -- palatial by camp standards -- remained empty as he bunked nearer to the workers. Straight-talking and cigar-chomping (a habit that earned him the nickname "Big Smoke"), he and politics didn't mix well. Signing on in 1905 "until he could predict success or failure according to his own judgment," Stevens resigned in 1907, the plans for further construction in place. After Panama, Stevens returned to the railroads, both at home and abroad. In 1917 he led Woodrow Wilson's American Advisory Committee of Railway Experts to Russia, designed to assist Russia's provisional government in improving the Trans-Siberian and Chinese Eastern Railways; and in 1919 he became president of the Inter-Allied Technical Board in Manchuria. Stevens retired in 1923, but for 20 years, until his death at age 90, he constantly received accolades for his contributions to engineering. Despite numerous honors, nothing ever compared to his send-off from the in-progress Panama Canal in 1907. One historian noted: "It was as if the people were honoring a man who had already built the Panama Canal."